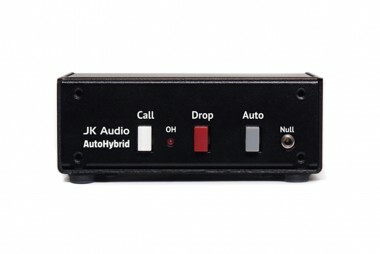 This simple, passive, auto-answer/disconnect telephone line hybrid allows simultaneous send and receive audio through analog telephone lines. Suitable for monitoring remote locations, IFB feeds, and many simple studio, conferencing, and PA telephone interface applications. The "Auto" feature is very simple. When the "Auto" switch is selected, AutoHybrid will answer on the first ring. The phone line will remain off-hook, until either the Drop button is depressed, or until the phone company releases the line.